This article is about the branch of primates which includes humans. For other uses, see Ape (disambiguation). For an obsolete term for apes which excludes humans, see Pongidae. For an explanation of very similar terms, see Hominidae. Apes (Hominoidea) are a branch of Old World tailless simians native to Africa and Southeast Asia. They are the sister group of the Old World monkeys, together forming the catarrhine clade. They are distinguished from other primates by a wider degree of freedom of motion at the shoulder joint as evolved by the influence of brachiation. In traditional and non-scientific use, the term "ape" excludes humans, and is thus not equivalent to the scientific taxon Hominoidea. There are two extant branches of the superfamily Hominoidea: the gibbons, or lesser apes; and the hominids, or great apes. The family Hylobatidae, the lesser apes, include four genera and a total of sixteen species of gibbon, including the lar gibbon and the siamang, all native to Asia. They are highly arboreal and bipedal on the ground. They have lighter bodies and smaller social groups than great apes. Except for gorillas and humans, hominoids are agile climbers of trees. Apes eat a variety of plant and animal foods, with the majority of food being plant foods, which can include fruit, leaves, stalks, roots and seeds, including nuts and grass seeds. Human diets are sometimes substantially different from that of other apes due in part to the development of technology and a wide range of habitation. Humans are by far the most numerous of the ape species, in fact outnumbering all other primates by a factor of several thousand to one. Most non-human hominoids are rare or endangered. The chief threat to most of the endangered species is loss of tropical rainforest habitat, though some populations are further imperiled by hunting for bushmeat. The great apes of Africa are also facing threat from the Ebola virus. Currently considered to be the greatest threat to survival of African apes, Ebola is responsible for the death of at least one third of gorillas and chimpanzees since 1990. "Ape", from Old English apa, is a word of uncertain origin. [b] The term has a history of rather imprecise usage—and of comedic or punning usage in the vernacular. Its earliest meaning was generally of any non-human anthropoid primate,[c] as is still the case for its cognates in other Germanic languages. Later, after the term "monkey" had been introduced into English, "ape" was specialized to refer to a tailless (therefore exceptionally human-like) primate. Thus, the term "ape" obtained two different meanings, as shown in the 1911 Encyclopædia Britannica entry: it could be used as a synonym for "monkey" and it could denote the tailless humanlike primate in particular. The distinction between apes and monkeys is complicated by the traditional paraphyly of monkeys: Apes emerged as a sister group of Old World Monkeys in the catarhines, which are a sister group of New World Monkeys. Therefore, cladistically, apes, catarrhines and related contemporary extinct groups such as Parapithecidaea are monkeys as well, for any consistent definition of "monkey". "Old World Monkey" may also legitimately be taken to be meant to include all the catarrhines, including apes and extinct species such as Aegyptopithecus, in which case the apes, Cercopithecoidea and Aegyptopithecus emerged within the Old World Monkeys. The cladogram of the superfamily Hominoidae shows the descendant relationships of the extant hominoids that are broadly accepted today. For each clade, it is indicated approximately how many million of years ago (Mya) newer extant clades radiated. Traditionally, humans were considered neither apes nor great apes, but today they are recognized as having emerged deep in the phylogenetic tree of apes. Thus, there are at least three common, or traditional, uses of the term "ape": non-specialists may not distinguish between "monkeys" and "apes", that is, they may use the two terms interchangeably; or they may use "ape" for any tailless monkey or non-human hominoid; or they may use the term "ape" to just mean the non-human hominoids. Modern biologists and primatologists use monophyletic groups for taxonomic classification; that is, they use only those groups that include all descendants of a common ancestor. [f] The superfamily Hominoidea is such a group—also known as a clade. Some scientists now use the term "ape" to mean all members of the superfamily Hominoidea, including humans. For example, in his 2005 book, Benton wrote "The apes, Hominoidea, today include the gibbons and orang-utan ... the gorilla and chimpanzee ... and humans". Modern biologists and primatologists refer to apes that are not human as "non-human" apes. Scientists broadly, other than paleoanthropologists, may use the term "hominin" to identify the human clade, replacing the term "hominid". See terminology of primate names. See below, History of hominoid taxonomy, for a discussion of changes in scientific classification and terminology regarding hominoids. Below is a cladogram with extinct species. It is indicated approximately how many million years ago (Mya) the clades diverged into newer clades. Like those of the orangutan, the shoulder joints of hominoids are adapted to brachiation, or movement by swinging in tree branches. The lesser apes are the gibbon family, Hylobatidae, of sixteen species; all are native to Asia. Their major differentiating characteristic is their long arms, which they use to brachiate through trees. Their wrists are ball and socket joints as an evolutionary adaptation to their arboreal lifestyle. Generally smaller than the African apes, the largest gibbon, the siamang, weighs up to 14 kg (31 lb); in comparison, the smallest "great ape", the bonobo, is 34 to 60 kg (75 to 132 lb). The superfamily Hominoidea falls within the parvorder Catarrhini, which also includes the Old World monkeys of Africa and Eurasia. Within this grouping, the two families Hylobatidae and Hominidae can be distinguished from Old World monkeys by the number of cusps on their molars; hominoids have five in the "Y-5" molar pattern, whereas Old World monkeys have only four in a bilophodont pattern. Further, in comparison with Old World monkeys, hominoids are noted for: more mobile shoulder joints and arms due to the dorsal position of the scapula; broader ribcages that are flatter front-to-back; and a shorter, less mobile spine, with greatly reduced caudal (tail) vertebrae—resulting in complete loss of the tail in living hominoid species. These are anatomical adaptations, first, to vertical hanging and swinging locomotion (brachiation) and, later, to developing balance in a bipedal pose. Note there are primates in other families that also lack tails, and at least one, the pig-tailed langur, is known to walk significant distances bipedally. The front of the ape skull is characterised by its sinuses, fusion of the frontal bone, and by post-orbital constriction. Although the hominoid fossil record is still incomplete and fragmentary, there is now enough evidence to provide an outline of the evolutionary history of humans. Previously, the divergence between humans and other living hominoids was thought to have occurred 15 to 20 million years ago, and several species of that time period, such as Ramapithecus, were once thought to be hominins and possible ancestors of humans. But, later fossil finds indicated that Ramapithecus was more closely related to the orangutan; and new biochemical evidence indicates that the last common ancestor of humans and non-hominins (that is, the chimpanzees) occurred between 5 and 10 million years ago, and probably nearer the lower end of that range; see Chimpanzee–human last common ancestor (CHLCA). Apart from humans and gorillas, apes eat a predominantly frugivorous diet, mostly fruit, but supplemented with a variety of other foods. Gorillas are predominately folivorous, eating mostly stalks, shoots, roots and leaves with some fruit and other foods. Non-human apes usually eat a small amount of raw animal foods such as insects or eggs. In the case of humans, migration and the invention of hunting tools and cooking has led to an even wider variety of foods and diets, with many human diets including large amounts of cooked tubers (roots) or legumes. Other food production and processing methods including animal husbandry and industrial refining and processing have further changed human diets. Humans and other apes occasionally eat other primates. Some of these primates are now close to extinction with habitat loss being the underlying cause. Although there had been earlier studies, the scientific investigation of behaviour and cognition in non-human members of the superfamily Hominoidea expanded enormously during the latter half of the twentieth century. Major studies of behaviour in the field were completed on the three better-known "great apes", for example by Jane Goodall, Dian Fossey and Birute Galdikas. These studies have shown that in their natural environments, the non-human hominoids show sharply varying social structure: gibbons are monogamous, territorial pair-bonders, orangutans are solitary, gorillas live in small troops with a single adult male leader, while chimpanzees live in larger troops with bonobos exhibiting promiscuous sexual behaviour. Their diets also vary; gorillas are foliovores, while the others are all primarily frugivores, although the common chimpanzee does some hunting for meat. Foraging behaviour is correspondingly variable. All the non-human hominoids are generally thought of as highly intelligent, and scientific study has broadly confirmed that they perform very well on a wide range of cognitive tests—though there is relatively little data on gibbon cognition. The early studies by Wolfgang Köhler demonstrated exceptional problem-solving abilities in chimpanzees, which Köhler attributed to insight. The use of tools has been repeatedly demonstrated; more recently, the manufacture of tools has been documented, both in the wild and in laboratory tests. Imitation is much more easily demonstrated in "great apes" than in other primate species. Almost all the studies in animal language acquisition have been done with "great apes", and though there is continuing dispute as to whether they demonstrate real language abilities, there is no doubt that they involve significant feats of learning. Chimpanzees in different parts of Africa have developed tools that are used in food acquisition, demonstrating a form of animal culture. Cladistically, apes, catarrhines, and extinct species such as Aegyptopithecus and Parapithecidaea, are monkeys, so one can only specify ape features not present in other monkeys. Apes do not possess a tail, unlike most monkeys. Monkeys are more likely to be in trees and use their tails for balance. While the great apes are considerably larger than monkeys, gibbons (lesser apes) are smaller than some monkeys. Apes are considered to be more intelligent than monkeys, which are considered to have more primitive brains. The history of hominoid taxonomy is complex and somewhat confusing. Recent evidence has changed our understanding of the relationships between the hominoids, especially regarding the human lineage; and the traditionally used terms have become somewhat confused. Competing approaches to methodology and terminology are found among current scientific sources. Over time, authorities have changed the names and the meanings of names of groups and subgroups as new evidence—that is, new discoveries of fossils and tools and of observations in the field, plus continual comparisons of anatomy and DNA sequences—has changed the understanding of relationships between hominoids. There has been a gradual demotion of humans from being 'special' in the taxonomy to being one branch among many. This recent turmoil (of history) illustrates the growing influence on all taxonomy of cladistics, the science of classifying living things strictly according to their lines of descent. In 1758, Carl Linnaeus, relying on second- or third-hand accounts, placed a second species in Homo along with H. sapiens: Homo troglodytes ("cave-dwelling man"). Although the term "Orang Outang" is listed as a variety - Homo sylvestris - under this species, it is nevertheless not clear to which animal this name refers, as Linnaeus had no specimen to refer to, hence no precise description. Linnaeus may have based Homo troglodytes on reports of mythical creatures, then-unidentified simians, or Asian natives dressed in animal skins. Linnaeus named the orangutan Simia satyrus ("satyr monkey"). He placed the three genera Homo, Simia and Lemur in the order of Primates. The troglodytes name was used for the chimpanzee by Blumenbach in 1775, but moved to the genus Simia. 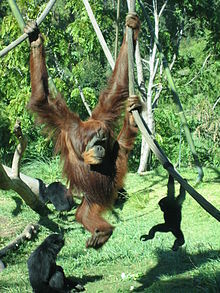 The orangutan was moved to the genus Pongo in 1799 by Lacépède. It is not pleasing to me that I must place humans among the primates, but man is intimately familiar with himself. Let's not quibble over words. It will be the same to me whatever name is applied. But I desperately seek from you and from the whole world a general difference between men and simians from the principles of Natural History. I certainly know of none. If only someone might tell me one! If I called man a simian or vice versa I would bring together all the theologians against me. Perhaps I ought to, in accordance with the law of Natural History. Accordingly, Johann Friedrich Blumenbach in the first edition of his Manual of Natural History (1779), proposed that the primates be divided into the Quadrumana (four-handed, i.e. apes and monkeys) and Bimana (two-handed, i.e. humans). This distinction was taken up by other naturalists, most notably Georges Cuvier. Some elevated the distinction to the level of order. Humans the non-apes: Until about 1960, taxonomists typically divided the superfamily Hominoidea into two families. The science community treated humans and their extinct relatives as the outgroup within the superfamily; that is, humans were considered as quite distant from kinship with the "apes". Humans were classified as the family Hominidae and were known as the "hominids". All other hominoids were known as "apes" and were referred to the family Pongidae. The "great apes" in Pongidae: The 1960s saw the methodologies of molecular biology applied to primate taxonomy. Goodman's 1964 immunological study of serum proteins led to re-classifying the hominoids into three families: the humans in Hominidae; the great apes in Pongidae; and the "lesser apes" (gibbons) in Hylobatidae. However, this arrangement had two trichotomies: Pan, Gorilla, and Pongo of the "great apes" in Pongidae, and Hominidae, Pongidae, and Hylobatidae in Hominoidea. These presented a puzzle; scientists wanted to know which genus speciated first from the common hominoid ancestor. Gibbons the outgroup: New studies indicated that gibbons, not humans, are the outgroup within the superfamily Hominoidea, meaning: the rest of the hominoids are more closely related to each other than (any of them) are to the gibbons. With this splitting, the gibbons (Hylobates, et al.) were isolated after moving the great apes into the same family as humans. Now the term "hominid" encompassed a larger collective taxa within the family Hominidae. With the family trichotomy settled, scientists could now work to learn which genus is 'least' related to the others in the Ponginae subfamily. Orangutans the outgroup: Investigations comparing humans and the three other hominid genera disclosed that the African apes (chimpanzees and gorillas) and humans are more closely related to each other than any of them are to the Asian orangutans (Pongo); that is, the orangutans, not humans, are the outgroup within the family Hominidae. This led to reassigning the African apes to the subfamily Homininae with humans—which presented a new three-way split: Homo, Pan, and Gorilla. Hominins: In an effort to resolve the trichotomy, while preserving the "outgroup" status of humans, the subfamily Homininae was divided into two tribes: Gorillini, comprising genus Pan and genus Gorilla; and Hominini, comprising genus Homo (the humans). Humans and close relatives now began to be known as "hominins", that is, of the tribe Hominini. Thus, the term "hominin" succeeded to the previous use of "hominid", which meaning had changed with changes in Hominidae (see above: 3rd graphic, "Gibbons the outgroup"). Speciation of gibbons: Later DNA comparisons disclosed previously unknown speciation of genus Hylobates (gibbons) into four genera: Hylobates, Hoolock, Nomascus, and Symphalangus. Skeletons of members of the ape superfamily, Hominoidea. There are two extant families: Hominidae, the "great apes"; and Hylobatidae, the gibbons, or "lesser apes". As discussed above, hominoid taxonomy has undergone several changes. Genetic analysis combined with fossil evidence indicates that hominoids diverged from the Old World monkeys about 25 million years ago (mya), near the Oligocene-Miocene boundary. The gibbons split from the rest about 18 mya, and the hominid splits happened 14 mya (Pongo), 7 mya (Gorilla), and 3–5 mya (Homo & Pan). In 2015, a new genus and species were described, Pliobates cataloniae, which lived 11.6 mya, and appears to predate the split between Hominidae and Hylobatidae. 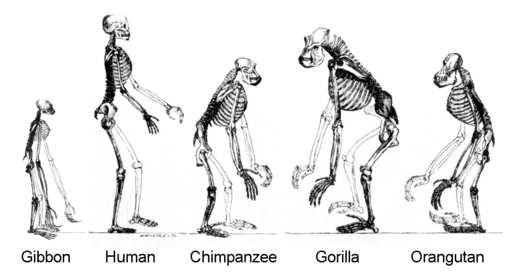 From left: Comparison of size of gibbon, human, chimpanzee, gorilla and orangutan. Non-human apes do not normally stand upright as their normal posture. ^ Although Dawkins is clear that he uses "apes" for Hominoidea, he also uses "great apes" in ways which exclude humans. Thus in Dawkins, R. (2005). The Ancestor's Tale (p/b ed.). London: Phoenix (Orion Books). ISBN 978-0-7538-1996-8 : "Long before people thought in terms of evolution ... great apes were often confused with humans" (p. 114); "gibbons are faithfully monogamous, unlike the great apes which are our closer relatives" (p. 126). ^ The hypothetical Proto-Germanic form is given as *apōn (F. Kluge, Etymologisches Wörterbuch der Deutschen Sprache (2002), online version, s.v. "Affe"; V. Orel, A handbook of Germanic etymology (2003), s.v. "*apōn" or as *apa(n) (Online Etymology Dictionary (2001–2014), s.v. "ape"; M. Philippa, F. Debrabandere, A. Quak, T. Schoonheim & N. van der Sijs, Etymologisch woordenboek van het Nederlands (2003–2009), s.v. "aap"). Perhaps ultimately derived from a non-Indo-European language, the word might be a direct borrowing from Celtic, or perhaps from Slavic, although in both cases it is also argued that the borrowing, if it took place, went in the opposite direction. ^ "Any simian known on the Mediterranean during the Middle Ages; monkey or ape"; cf. ape-ward: "a juggler who keeps a trained monkey for the amusement of the crowd." (Middle English Dictionary, s.v. "ape"). ^ Dawkins 2005; for example "[a]ll apes except humans are hairy" (p. 99), "[a]mong the apes, gibbons are second only to humans" (p. 126). ^ Rush, James (23 January 2015). "Ebola virus 'has killed a third of world's gorillas and chimpanzees' – and could pose greatest threat to their survival, conservationists warn". The Independent. Archived from the original on 30 March 2015. Retrieved 26 March 2015. Chisholm, Hugh, ed. (1911). "Ape" . Encyclopædia Britannica. 2 (11th ed.). Cambridge University Press. p. 160. ^ a b M. Goodman; D. A. Tagle; D. H. Fitch; W. Bailey; J. Czelusniak; B. F. Koop; P. Benson; J. L. Slightom (1990). "Primate evolution at the DNA level and a classification of hominoids". Journal of Molecular Evolution. 30 (3): 260–266. Bibcode:1990JMolE..30..260G. doi:10.1007/BF02099995. PMID 2109087. ^ a b Nengo, Isaiah; Tafforeau, Paul; Gilbert, Christopher C.; Fleagle, John G.; Miller, Ellen R.; Feibel, Craig; Fox, David L.; Feinberg, Josh; Pugh, Kelsey D. (2017). "New infant cranium from the African Miocene sheds light on ape evolution". Nature. 548 (7666): 169–174. Bibcode:2017Natur.548..169N. doi:10.1038/nature23456. PMID 28796200. ^ Alba, D. M.; Fortuny, J.; Moyà-Solà, S. (22 July 2010). "Enamel thickness in the Middle Miocene great apes Anoiapithecus, Pierolapithecus and Dryopithecus". Proceedings of the Royal Society of London B: Biological Sciences. 277 (1691): 2237–2245. doi:10.1098/rspb.2010.0218. ISSN 0962-8452. PMC 2880156. PMID 20335211. ^ Grabowski, Mark; Jungers, William L. (12 October 2017). "Evidence of a chimpanzee-sized ancestor of humans but a gibbon-sized ancestor of apes". Nature Communications. 8 (1): 880. Bibcode:2017NatCo...8..880G. doi:10.1038/s41467-017-00997-4. ISSN 2041-1723. PMC 5638852. PMID 29026075. ^ Lawton, Graham. "Every human culture includes cooking – this is how it began". New Scientist. ^ Hoag, Hannah (2 December 2013). "Humans are becoming more carnivorous". Nature. Retrieved 26 November 2014. ^ Callaway, Ewen (13 October 2006). "Loving bonobos have a carnivorous dark side". New Scientist. Retrieved 26 November 2014. ^ Marshall, Michael. "Chimpanzees over-hunt monkey prey almost to extinction". www.bbc.com. ^ "Extinction Threat To Monkeys And Other Primates Due To Habitat Loss, Hunting". ScienceDaily. ^ William McGrew (1992). Chimpanzee material culture: implications for human evolution. ^ a b c Groves, C.P. (2005). Wilson, D.E. ; Reeder, D.M. (eds.). Mammal Species of the World: A Taxonomic and Geographic Reference (3rd ed.). Baltimore: Johns Hopkins University Press. pp. 178–184. ISBN 0-801-88221-4. OCLC 62265494. ^ a b Mootnick, A.; Groves, C. P. (2005). "A new generic name for the hoolock gibbon (Hylobatidae)". International Journal of Primatology. 26 (4): 971–976. doi:10.1007/s10764-005-5332-4. ^ "Letter, Carl Linnaeus to Johann Georg Gmelin. Uppsala, Sweden, 25 February 1747". Swedish Linnaean Society. ^ Charles Darwin (1871). The Descent of Man. ISBN 978-0-7607-7814-2. ^ G. G. Simpson (1945). "The principles of classification and a classification of mammals". Bull. Am. Mus. Nat. Hist. 85: 1–350. ^ M. Goodman (1964). "Man's place in the phylogeny of the primates as reflected in serum proteins". In S. L. Washburn (ed.). Classification and human evolution. Aldine, Chicago. pp. 204–234. ^ M. Goodman (1974). "Biochemical Evidence on Hominid Phylogeny". Annual Review of Anthropology. 3 (1): 203–228. doi:10.1146/annurev.an.03.100174.001223. ^ "A new primate species at the root of the tree of extant hominoids". 29 October 2015. ^ Cochrane, Joe (2 November 2017). "New Orangutan Species Could Be the Most Endangered Great Ape". The New York Times. Retrieved 3 November 2017. Pilbeam D. (September 2000). "Hominoid systematics: The soft evidence". Proc. Natl. Acad. Sci. U.S.A. 97 (20): 10684–6. Bibcode:2000PNAS...9710684P. doi:10.1073/pnas.210390497. PMC 34045. PMID 10995486. Retrieved 27 August 2015. Agreement between cladograms based on molecular and anatomical data.